August 2018 focused on unique pencils! 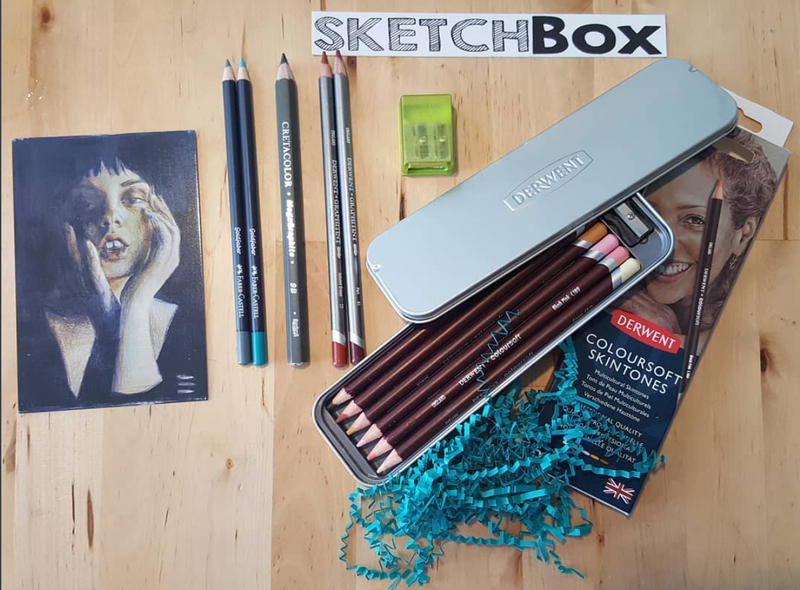 Our basic box included a full set of Derwent Coloursoft pencils in skin tone colors perfect for portraits or muted landscapes. We also included two Derwent Graphitint pencils. These are graphite pencils with colored tint added that are water soluble. We included two curated colors to compliment the colors in your new skin tones set. We also included two NEW Goldfaber pencils from Faber-Castell. These pencils have soft leads and have intense color laydown. We included two curated colors that increase the color range of your palette this month. We also included a Cretacolor MegaGraphite pencil in 9B lead. These pencils are great to sketch out your drawing before adding color. They're also great for shading since the lead is much larger than that of a regular pencil. Finally we included a KUM 2 in 1 box sharpener to keep all your pencils sharp. This picture was taken by our subscriber @CuriousDoodler on instagram!